Over the weekend I ran in the Oklahoma City Memorial Marathon. I did not run the marathon, because I am not super human. 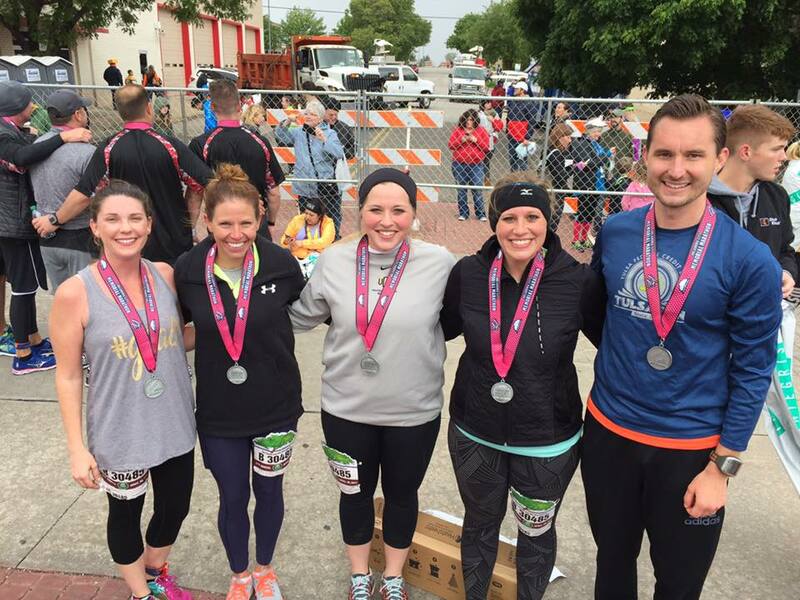 I ran on a relay team that, between the five of us, we ran 26.2 miles. If you’ve never been around an organized race, it is quite the event. Even for someone like myself, who purely runs out of necessity, it made me feel as if I could go run a marathon. This race was especially inspiring due to the fact that it was in memory of the lives lost in the April 19, 1995 bombing of the Murrah building. Yesterday as I ran, I would like to say I had a lot of time to think and reflect on why I ran this race, but to be completely honest, it was a tough run, and I was mostly focused on finishing. Along the way however, the streets were lined with people, encouraging those of us who were running. Complete strangers cheering as if they knew each and every runner. As I was running, someone in front of me started walking, and the runner slightly behind them patted them on the back and said some encouraging words to help them to continue running the race. That person did not stop and say “How dare you stop running, you sluggard! Get out of my way!” No, they offered encouragement. What a world it would be if we encouraged first, without questioning the struggling brother or sister, rather than chastising and looking down upon them. Running is just as much a mental test as it is a physical test. Of course, your body will tire and at that point. It is up to you to decide whether you will continue to run the race, regardless of the hurt and the pain, or just stop dead in your tracks. This behavior reflects the ups and downs in our earthly lives as Christians. There are times where we grow weary of running the race and want nothing more than to stop and catch our breath. I considered doing this when I was about .7 miles away from my finish line yesterday. Many times on my hilly section of the race, when faced with another hill, I asked myself if this was some kind of sick joke. ANOTHER HILL? In life, there are hills. It is up to us whether we face them boldly, or turn and run in the other direction. In those times, when we are weak, that is when turning to the Lord is the only option. My leg of the race was only 3.35 miles, however, it was more difficult than I anticipated. Through the Lord, I finished my leg of the race. I want you to know that you are not alone! There is a body of believers that wants to support and lift you up, running the race alongside you. If we fail, we have an all-knowing and all-powerful God to pick you up. So run your race. Do it with strength and humility that the Lord provides us. When you see those around you stumble, be the first to pick them up rather than cast judgement upon them. Point others towards Christ, the ultimate prize for all those who believe.